This is a weekly meme hosted by Jill from Breaking the Spine. "Waiting on Wednesday" spotlights upcoming releases that we're eagerly anticipating. What are you waiting for? My UK blogger friends have been talking about this book for awhile and sadly, it won't be published in the US until July. Since I am an English teacher and adore William Shakespeare, this book immediately peaked my interest. I am going to be waiting patiently for this one! I believe the cover on top is the US cover and the cover on the bottom is the UK cover. Anyone know for sure? I prefer the UK cover. The US cover looks extremely similar to The Education of Bet, which was my "Waiting on Wednesday" a few weeks ago. What do you guys think? Either way, if this book sound like something you might enjoy, you can read the first chapter here! 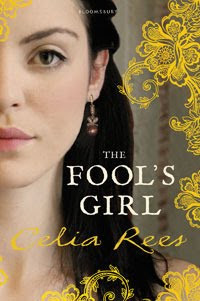 Goodreads says, "A lush, epic historical novel by bestseller Celia Rees, with an added Shakespearean twist. Young and beautiful Violetta may be of royal blood, but her kingdom is in shambles when she arrives in London on a mysterious mission. Her journey has been long and her adventures many, but it is not until she meets the playwright William Shakespeare that she gets to tell the entire story from beginning to end. Violetta and her comic companion, Feste, have come in search of an ancient holy relic that the evil Malvolio has stolen from their kingdom. But where will their remarkable quest—and their most unusual story—lead? In classic Celia Rees style, it is an engrossing journey, full of political intrigue, danger, and romance. This wholly original story is spun from Shakespeare’s Twelfth Night, and includes both folly and suspense that would make the Bard proud. " Sounds so lovely, and the cover really captured my attention. I have never read anything by Celia Rees. I think I should start. This book does sound amazing. I like both covers, but I think I am most partial to the UK version. I am excited about this book as I really love Rees. Thanks for sharing. 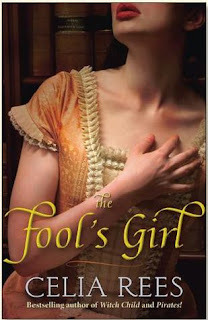 My WoW pick for the week is over at bookwanderer, if you're interested! I definitely prefer the UK cover too. How cool that we are both so excited for this book. We are kindred bookish spirits! Very cool choice. The covers are appealnig as well. Here'sMine. Sounds like a fun and unique read. Nice pick! Mine is at The Crowded Leaf. The girl is wearing the same dress but in a different color and both have their hands in similar gestures. I prefer the U.K. cover too. If you can't wait that long and it isn't too expensive you could get the UK version from the Book Depository. I am really looking forward to this one too. I liked Pirates! and Sovay so I have a feeling I'll love this, especially with the Shakespeare link. It was my WoW pick a few weeks ago too. Sounds very interesting, I haven't read anything by Celia Rees, but this one will go on my TBR list. I love my Shakespeare, so I think I'll really like this one too. I'm loving the second cover most. Christina T- Thanks for the heads up on the Book Depository. I might just have to do that. I hate waiting for books. I'm the worst!! UK cover is the best in my opinion. I cant wait for this book, it sounds loveley!! !